I prepared these steaks for the first time while still cooking in my Lake Jackson kitchen. I remember it was this time of the year because the boys were home during the day, enjoying their Christmas break from school. When supper is ready at our house, the outside world ceases to exist — the television is turned off, video and computer games are paused, my husband’s book is set aside — and so it was that day. We put individual interests aside to gather around our everyday kitchen table . And though we didn’t know it at the time, we sat down to what I now know as the best chicken fry I’ve ever tasted — including all those wonderful versions encountered over the years at various mom and pop restaurants. The meal has become one of our favorite everyday recipes. The mother of this recipe originates from one of my Junior League cookbooks; but like any good recipe, adaptions are born out of years of preparing it. It’s one of those recipes easy to make but good enough to serve company. Three years ago I made it for Christmas dinner at my folks. And two years ago I made it for my mother-in-law’s January 2nd birthday party. Making it for a crowd requires a little more orchestration, but it’s worth the effort. Of course, like anything fried with gravy, this meal is not on the top of a heart-healthy list. But it is Southern comfort food at its absolute best. And sometimes it’s good to splurge, when we can afford to do so. Heat 1/2 cup canola oil in large skillet, over medium to medium-high heat. When oil is hot, carefully add steak. Cook approximately 5 minutes on each side until golden brown. Remove to plate. Carefully remove all but 3 Tbsp on leftover oil from pan. Leave in flour drippings. Gradually stir in 5 Tbsp of flour into oil, letting it cook and bubble for a minute. Add 1 1/2 cups of milk and 3/4 tsp salt and 1/4 tsp pepper. Cook until thickened, stirring constantly. (You may wish to add extra milk for thinner gravy.) Pour into bowl for serving. I don’t dare let my mom see this photo or I’d be making chicken-fried this very minute. It’s one of those recipes I’ve never had the courage to try, leaving it for restaurant visits. This looks do-able. Chicken-fried steak was the first Texas custom my mom decided to approve. Every time she’d get down in the dumps about having to live in such a gawdforsaken place, I’d take her out for chicken-fried. She gained five pounds, but she was happier. It’s very easy. My dad (also a Northern transplant) loves Chicken Fry too. I seem to recall that Dad WAS the reason I made it at my parents for Christmas supper three years ago. I guess it says a lot that I thought the dish special enough to serve at a big Christmas gathering. 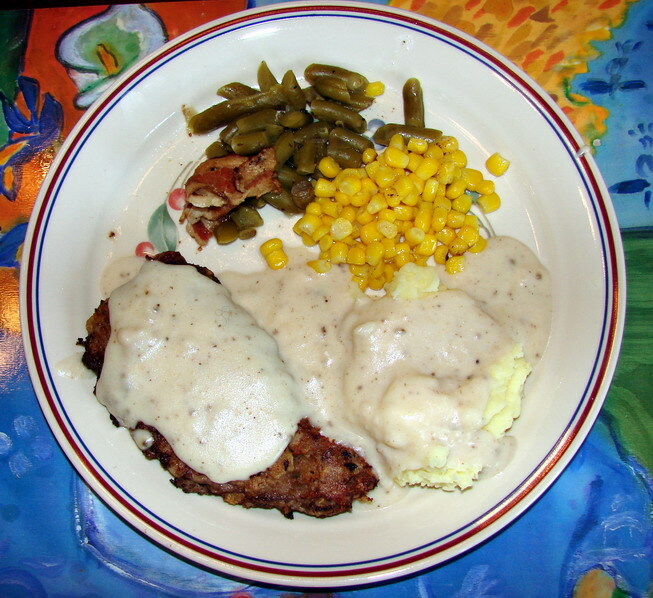 Funny story about your Mom and her cure for Texas desolation — but I bet your mom’s not the only one in the world to be consoled by a little Chicken Fry Steak and Gravy. When we sit down to eat, the outside world ceases to exist here too. I love how you wrote that. I love chicken fried steak. I bet I could make a good gf/cf one. I haven’t tried, but you’ve given me a hankerin’ for it again. I already make great cf “cream” gravy. I won’t even hazard a guess, but a white Christmas would be lovely. My last white Christmas was in Lake Jackson of all places — five years ago. We were sitting in church Christmas Eve singing Christmas carols when snow begin to softly circle down from the skies. Snowflake somersaults. It’s a memory I’ll cherish forever. Even without snow next week, we can still cherish our quiet dinners. Eating with outside world stilled is a sacred moment in our everyday lives. And as for the gluten-free Chicken Fry, anyone who can gf/turkey is surely one who can do steak as well. Good luck with it Dee. I’m interested in hearing how your experiment goes.